For the massacre, see Deir Yassin massacre. Name Meaning "Monastery of [Sheikh] Yassin"
Deir Yassin (Arabic: دير ياسين‎, Dayr Yâsîn) was a Palestinian Arab village of around 600 people near Jerusalem. It had declared its neutrality during the 1947–1948 Civil War in Mandatory Palestine between Arabs and Jews. It was depopulated after a massacre of around 107 of its residents on April 9, 1948 by paramilitaries from the Irgun and Lehi groups. The village buildings are today part of the Kfar Shaul Mental Health Center, an Israeli public psychiatric hospital. The first part of the village's name Deir is defined as "monastery" in Arabic. According to Palestinian historian Walid Khalidi, this was a common occurrence in Palestinian village names especially those so close to Jerusalem. A large ruin that laid at the southwestern edge of Deir Yassin was known simply as "Deir". The nucleus of settlement activity in the area during the Ottoman era—which began in 1517—was Khirbet Ayn al-Tut ("The Ruin of the Mulberry Spring")—some 500 meters (1,600 ft) west of the 1948 village site. In 1596, this village was under the administration of the nahiya ("subdistrict") of Jerusalem, part of the larger District of Jerusalem. It paid taxes on wheat, barley, and olive trees. It is unknown precisely when settlement shifted to Deir Yassin, but it is known that the village was named in honor of a Sheikh Yassin whose tomb is in a mosque located just outside the village. In the late 19th century, the houses of Deir Yassin were built of stone and two springs—one located in the north and another in the south—provided the village with water. Most of its houses, strongly built with thick walls, were clustered in a small area known as the Hara meaning "Quarter" or "Neighborhood". All of its inhabitants were Muslims. In 1906, a Jewish suburb of Jerusalem, Givat Shaul, was built across the valley from Deir Yassin. The secondary road linking the village to Jerusalem and the road to Jaffa ran through the suburb. During World War I, the Ottomans fortified the hilltop of Deir Yassin as part of the defense system of Jerusalem, but on December 8, 1917, these fortifications were stormed by the Allied Forces under Edmund Allenby. The following day Jerusalem fell to the British. Until the 1920s, Deir Yassin's inhabitants mostly depended on agriculture and livestock for income, but the extensive building projects in Jerusalem in the British Mandate period transformed its basis of economy. Residents began to excavate large quarries of limestone which the area around Deir Yassin was rich in. This developed into an increasingly thriving industry in stone-cutting and processing; by the late 1940s there were four stone crushers functioning in the village. The business encouraged the more prosperous inhabitants to invest in trucking and others became truck drivers. In 1935, a local bus company was established in a joint venture with the neighboring Arab village of Lifta. As Deir Yassin prospered, houses radiated from the Hara uphill and eastward, towards Jerusalem. Family from Deir Yassin, 1927. In the early days of the British Mandate, Deir Yassin had no school of its own and its children attended the school at Lifta or in Qalunya. By 1943, two elementary schools were built—one for boys and one for girls. The girls' school had a resident headmistress from Jerusalem. At this time, Deir Yassin also had a bakery, two guesthouses, and a social club—the "Renaissance Club", a thrift fund, three shops, four wells and a second mosque built by Mahmud Salah, an affluent resident. Many inhabitants were employed outside the village in the nearby British Army camps as waiters, carpenters, and foremen; others as clerks and teachers in the mandatory civil service. By this time, no more than 15% of the population was engaged in agriculture. Relations between Deir Yassin and its Jewish neighbors had started reasonably well under the Ottomans, particularly early on when Arabic-speaking Sephardic Yemenite Jews comprised much of the surrounding population. Relations rapidly deteriorated with the growth of Zionism in Palestine and reached their apex during the Arab revolt in 1936-1939. Relations picked up again during the economic boom years of full employment of World War II. Thus, in 1948, Deir Yassin was a prosperous, expanding village at relative peace with its Jewish neighbors with whom much business was done. In an effort by the Jewish militias to clear the road to Jerusalem, which was being blockaded by Arab forces, Deir Yassin was attacked and emptied of its inhabitants on April 9, 1948, by 120 Irgun and Lehi forces, reinforced by Haganah troops. The invasion was part of the Haganah's Operation Nachshon. A unit from the Palmach, the Haganah's strike force, took part in the assault using mortars. Around 107 villagers, including women and children, and four Irgun or Lehi men were killed. The incident became known as the Deir Yassin massacre. A year later, the Jewish neighborhood of Givat Shaul Beth was built on Deir Yassin's land, despite scholarly protests to Israeli Prime Minister David Ben Gurion. In 1951, construction of the Kfar Shaul Mental Health Center began using the village buildings themselves. The villages' houses and its school are now used by the Kfar Shaul Mental Health Center, an Israeli public psychiatric hospital. Many of the village houses on the hill are still standing and have been incorporated into an Israeli hospital for the mentally ill that was established on the site. Some houses outside the fence of the hospital grounds are used for residential and commercial purposes, or as warehouses. Outside the fence, there are carob and almond trees and the stumps of olive trees. Several wells are located at the southwestern edge of the site. The old village cemetery , southeast of the site, is unkempt and threatened by debris from a ring road that has been constructed around the village hill. One tall cypress tree still stands at the center of the cemetery. The killings at Deir Yassin are regarded as one of two pivotal events that led to the exodus of around 700,000 Palestinians from their towns and villages in 1948, along with the defeat of the Palestinians in Haifa. News of the killings, amplified by Arab media broadcasts of atrocity, triggered fear and panic among Palestinians, who in turn increasingly evacuated their homes. On April 10, 1948, one day after the Deir Yassin massacre, Albert Einstein wrote a critical letter to the American Friends of Fighters for the Freedom of Israel (the U.S chapter of the Stern gang) refusing to assist them with aid or support to raise money for their cause in Palestine. On December 2, 1948, many prominent American Jews signed and published an op-ed article in the New York Times that was critical of Menachem Begin and the massacre at Deir Yassin. A year after the massacre, the settlement Givat Shaul Beth was founded by religious Jews on the place of former Deir Yassin. It was later incorporated as a neighborhood into the city of Jerusalem. In 1980, the remaining ruins of the village were bulldozed to clear the ground for new Orthodox Jewish neighborhoods. The streets in the new neighborhoods were named after units of the Irgun, which perpetrated the massacre, and units of the Hagannah. In the early 1980s, most of the Deir Yassin cemetery was bulldozed and a new highway to Givat Shaul Bet was built in its place. Deir Yassin was built on the eastern slopes of a hill, with an elevation of roughly 800 meters (2,600 ft) above sea level and commanding a wide view all around it. The village faced the western suburbs of Jerusalem which were 1 kilometer (0.62 mi) away. The city center of Jerusalem was about 5 kilometers (3.1 mi) to the east. It was separated from the city by a terraced valley planted with fig, almond, and olive orchards. Along the northern rim of the valley ran a secondary road linking Deir Yassin to the suburbs and to the main Jaffa Road which was about 2 kilometers (1.2 mi) to the north. The total land area of the village consisted of 2,857 dunams, of which 94.5% was Arab-owned, 5.3% was Jewish-owned and the remainder was public property. 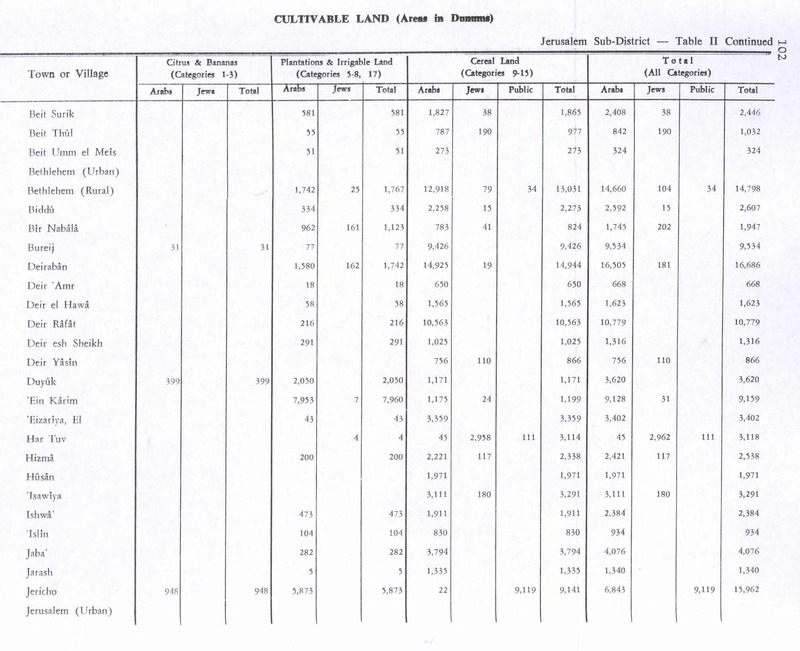 Cultivable land amounted to a total of 866 dunams (30%), all of which was grown with grains and owned mostly by Arabs. The built-up area of the village was 12 dunams. Khirbet Ayn al-Tut had a population of 39 in 1596, during early Ottoman rule. 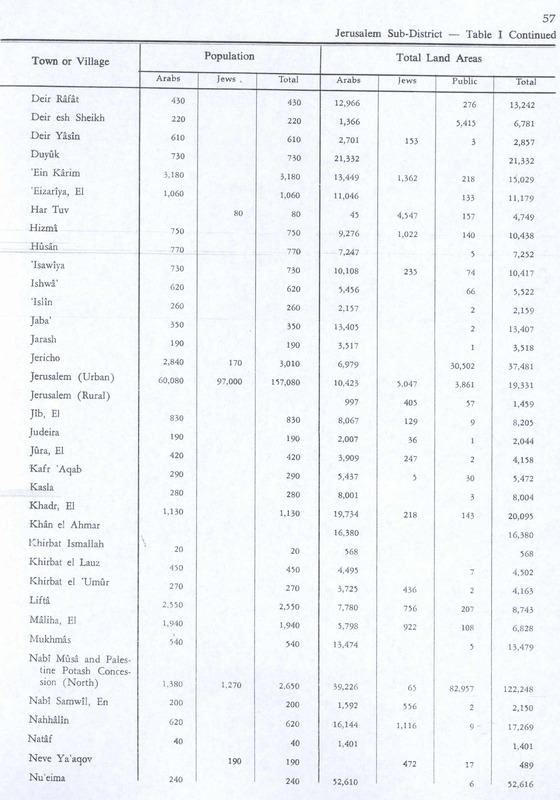 In the 1922 British Mandate census, Deir Yassin had a population of 254. Its population had increased from 428 in 1931 to 750 in 1948 and its houses from 91 in the former year to 144 in the latter. Before its depopulation in 1948, it is estimated that Deir Yassin had 610 residents in 1945. The five hamulas (clans) of Deir Yassin were the Shahada, 'Aql, Hamidad, Jabir and Jundi. ^ a b Moreno, 1959, p. 279. ^ a b c d e f g Khalidi, 1992, p.289. ^ a b c d Khalidi, 1992, p.290. ^ Segev 1998, pp. 87-88. The source says: "By the summer of 1949, 5 acres of olive groves had already been ploughed over and 300 crates of plums had been marketed from the village orchards. The grape harvest began and a new settlement was well under way. The village was now given the name Givat Shaul Bet. In the past it had been known as Deir Yassin." ^ Morris 2004, pp. 239–240. ^ "Palestine Remembered: Deir Yassin". http://www.palestineremembered.com/Jerusalem/Dayr-Yasin/index.html#Articles. ^ "Wrestling With Zion: Re-thinking Jewish Tradition and the Ongoing Crisis in the Middle East". http://www.acjna.org/acjna/articles_detail.aspx?id=321. ^ a b Hadawi, 1970, p.57. ^ Welcome To Dayr Yasin Palestine Remembered. Morris, Benny (2004). The Birth of the Palestinian Refugee Problem Revisited. Cambridge University Press. Segev, Tom (1998). 1949. The First Israelis. Owl Books by Henry Holt and Company. Dayr Yasin, by Rami Nashashibi (1996), Center for Research and Documentation of Palestinian Society.